2004, FOOD, Recipes, what am I drinking with this dish? It has to do partially with a dish that Antoine Heerah at the Chamarré did for us not long ago, he presented it as ‘foie gras de la mer’ (foie gras of the sea)…and it was pan seared monkfish liver, that was so creamy and flavorful that it did taste sort of like foie gras. It also has to do with the fact that Omar-the fishmonger at Pepone’s Poissonerie-NEVER has monkfish liver, and today he does. The Duc’s been asking him about it for months. Here it is. Here is his chance. Omar wants to sell him the whole crate full, but the Duc manages to buy a small amount. ‘First I need to test it out’ he convinces Omar. He comes home with a big smile, monkfish liver and a couple of oysters. We need to see if the combo works and weather the Gillardeau numero 2 or Spéciales numero 3 is better. The monkfish liver really looks like goose liver, if only a little more grainy. It is easy to cut and clean. We cut slices that we pan sear-olive oil, salt and pepper. A little one at first to test out taste and time that it needs to be cooked. I like it with a little bit of crunch on the outside; it makes for a play of textures that is fun. And also a play of tastes, grilling –to get the crunch- brings more bitterness to grilled outside of the liver. We shuck the oysters and pan sear them too- olive oil, salt and pepper. The Gillardeau is almost too concentrated a flavor, and seems much saltier than the spéciale 3. The spéciale 3 works perfectly. The oyster is firm and yet soft, and so is the monkfish liver. Both are a different expression of the sea, both have bitterness. 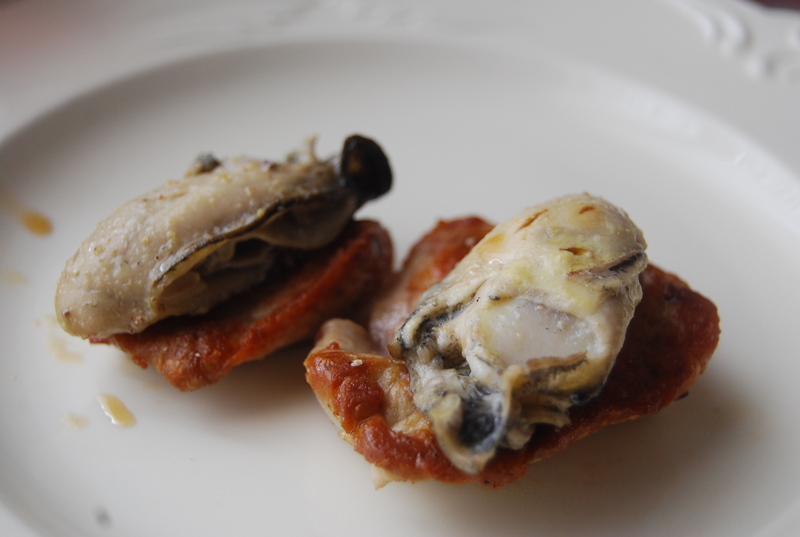 The monkfish liver is more animal, more meaty and the oyster has more iode (fresh low tide). The white pepper that we used links the two in a way that is very complex. A unique combination. We serve it to friends from Singapore and KL that night who lick their plates clean tell us that have never had anything like it. We have it with Champagne Vergnon 2004 Brut Nature. I would not have thought that this blanc de blanc would have enough bitterness to stand up to the liver, but it works, partially because of the pepperiness, and the bubbles also bring some bitterness. One of the reasons that vinous (concentrated) champagnes can replace white wines and sometimes red wines with food. Where can I buy monk fish liver in Paris? Your recipe sounds wonderful. Is there a season like oysters?